January 31, 2010 draws to an end with a scenic sunset. 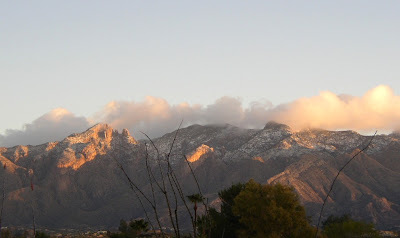 Photo above taken at 5:55 pm MST, looking north at the Catalina Mountains from our backyard. Have some grumbles about weather products I've examined today. 1 - Arizona Daily Star and KVOA weather page in this morning's Sunday paper. The chance of rain is given in the paper as 0% for both Tuesday and Wednesday. 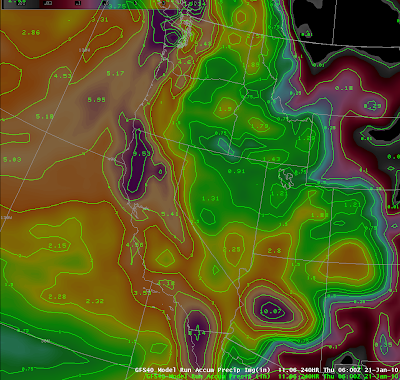 Shown above is the NAM forecast of 48-hour rainfall amounts for the 48-hours ending at 5 pm Wednesday afternoon. Hmmm, somebody is not coordinated here. There is a statement on the Star weather page that: Forecasts and graphics, with the exception of KVOA[sic], provided by AccuWeather.com. I don't know what exactly that statement means. It could be that everything on the Sunday Star weather page is from AccuWeather, except for the photo of Matt Brode and the Channel 4 logo. What I do know for sure is that the forecast for rain during midweek did not suddenly pop into the NWS forecasts this morning after the newspaper had gone to press last night! THE COAST OF THE PACIFIC NW WILL SWING THROUGH NRN BAJA. Hmmm, I don't know what exactly this statement means and "energy" is not defined in the NWS glossary for the general reader. The use of this kind of loose terminology in technical discussions is one of my pet peeves. Perhaps the writer was referring to some kinetic energy? But I think not - I suspect that this is jargon for - a local maxima of cyclonic vorticity at 500 mb. Or perhaps?? 3 - From the 2:35 pm Sunday afternoon (31 Jan 2010) Tucson NWS Forecast discussion: SHORT WAVE RIDGING WILL BE TRANSITIONING ACROSS THE STATE IN ADVANCE OF NEXT PACIFIC STORM. Again, it's not very clear what this statement means precisely. Meteorologically, "ridging" usually means the building or strengthening of a ridge at some level in the atmosphere. Transitioning is used here, I am fairly certain, to mean - moving over or translating across the state. Again, just a couple of my pet peeves about imprecise technical writing. The upside is that it again appears that we'll have some weather to watch during the coming week! The storm over Arizona has moved on eastward, encountering very cold air over southern Plains and mid-Mississippi Valley, and producing widespread ice and heavy snow. 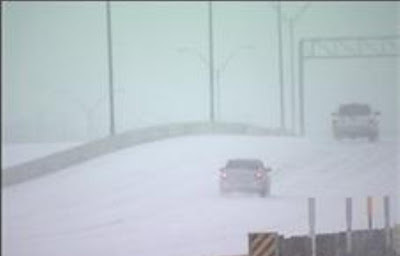 Photo above is yesterday from Amarillo, Texas, where I-40 was closed both to west and east. Here at house another 0.13" of rain fell during the morning yesterday (Thursday the 28th), bringing the month's total to 2.96" - which is the most January rain during the 11 years I've had my rain gauge up. Previous wettest January was during 2001 when I measured 2.31". 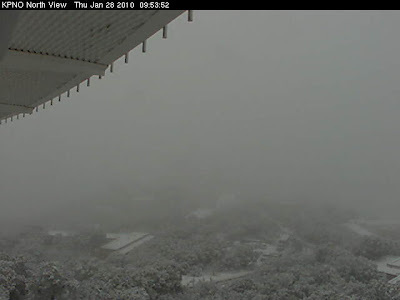 Webcam above shows that it was snowing on Kitt Peak at midmorning. Elevation of Kitt Peak is about 6800 ft MSL. 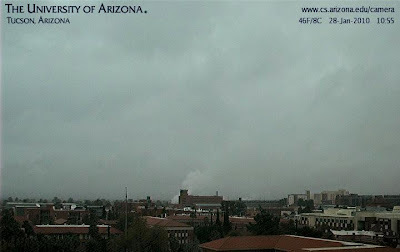 Top photo shows a soggy U of A campus at late morning, with the Catalinas completely obscured. Weak 500 mb low is spinning almost directly overhead this morning. It has brought widespread rains overnight with amounts in southeast Arizona generally from a tenth to about an inch. The rain continues off and on this morning with additional accumulations. The GFS spagetti chart for 336 hours from the model ensemble indicating that most members continue to indictate a Pacific split in the flow with two principal storm tracks over the continent. The two 500 mb height contours shown are 522 and 564 decameters. Comments most welcome! Shown above is the GFS 200 mb operational forecast for 336-hours valid 00 UTC Sunday February 7, 2010. The very strong west-to-east jetstream continues across the Pacific into February according to this model's forecast. These are very interesting forecasts and we'll have to watch how they verify during the coming two weeks of predicted active weather. Shown above is the ECMWF four-panel forecast for 168-hours from 00 UTC Sunday January 24, 2010. It indicates a continuing, active progression of S/Ws from off the Pacific and into the continental U.S. The main change indicated by this forecast is that the storms are no longer blocked over the West and progress all the way across the country. and all were during the night - between sunset and sunrise except for less than a 1/10" which fell yesterday between 7 and 8 am. First event (one could call each of these separate storms embedded within the larger Pacific trough) was on Tuesday night and produced 0.54" of rain here; second events was on Thursday night with 1.18"; and third event was Friday night (last night) with 0.69" in the gauge this morning [four-day total of 2.41"]. Other parts of the state had more spectacular totals and the Salt/Verde drainages have record 5 day totals for rain/snow. Lots of snow; road closures; and wind with the first two events. Here in the southeast part of state there was little lightning and thunder during the four days - none here at house and none at the regular observing sites. This event will certainly help with water supply and dampen the terrible drought we've been experiencing. May be some convective showers today, but we're basically back to watching the evolution of features over the Pacific for the coming week. The most intense portion of the Pacific storm moved through last night. Winds were gusty, mostly from 35 to 55 mph - not nearly as strong as with the early December event. Found three max gusts above 60 mph - roof of Atmo., top of Mt. Hopkins, and Gutherie RAWS. Rain amounts in Pima County ALERT network were generally 3/4" to around 3" with 8 stations reporting 2 " or more. One station reported over 7" but that's a real outlier and will need to be checked. Rain here at house through 7 am was 1.18" - most rain in 24 hours since August 13th 2008. Luckily only a bit of leaking into my storage room at back of casita. Reports of a tornado north of Phoenix and a small tornado apparently moved across I-10 just on the California side of Colorado River. Washes are flowing here in Tucson and cars are stuck or floating away, as per usual when the washes flow! 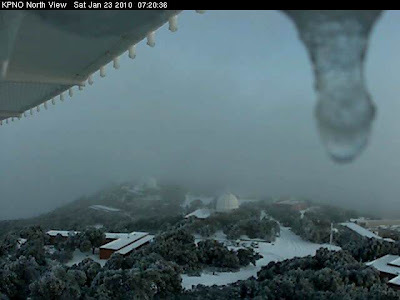 Image above shows Kitt Peak and indicates that the rain must have turned briefly to snow out there. Blowing dust...flooding...blizzard conditions...how about beach erosion? "Mesonet" stations at Puerto Penasco/Rocky Point have had SSE winds sustained at 30 mph+ since midnight, and gusts above 50 mph this afternoon. Both stations (one is WxUnderground, the other CEDO) are on Las Conchas, an east-west oriented barrier island. After more than one tide cycle, I imagine there is some erosion taking place. Who needs nor'easters when we have sou'westers? I've never seen blowing dust in a nor'easter! Plus a tornado watch across ssouthwestern Arizona! Mike Leuthold comments re question below - I believe it's partially due to downsloping caused by the higher terrain of central Pima county. You can see a drying in the 850 layer over Pinal and eastern Pima in the model data. Also a factor, the moisture plume (see above) is centered over western Pima into Maricopa during the day today and it's quite dry at 850 from eastern Pima eastward. Gusty winds really picked up early this afternoon - over 60 mph at Atmo. Dept. and somewhere to southeast was open terrain that hadn't had much rain. Result was an ugly, thick plume of blowing dust that has worked northwestward and now obscures everything to the north. Up to the north, snow has turned to heavy rain so there is a hydrologic nightmare as it falls onto a heavy accumulation of snow cover. Reply from Mike Hardiman - Not sure that new zones are the answer (they're sort of an outdated concept), but I agree the maps are misleading. They should be based on the Hazard Grids, which can be created by elevation. It is probably in the works, but I haven't heard anything definitive. Jack also asks - Forgive what may be a silly question, but on the U of A model runs, Tucson seems to be always in a relative minimum of precip? Is the valley rain shadowed under most atmospheric flow situations? I did not think the Tucson mountains were nearly high enough to do this. Often the valley is rain-shadowed - but usually under weaker flow regimes/dynamics. Given the current situation with strong forcing for vertical motion and a very deep, nearly saturated layer, I think that the terrain to the southwest should have minimal impacts on the precipitation distribution. Consider the map above - the terrain within the area bounded by a line from Three Points, to Sells, then down to a bit south of the border, east to Nogales, north to Green Valley, and then back to Three Points seems to be the terrain related to the Tucson/U of A rainfall minimum. The Tucson Mountains are probably not in play. Perhaps when things quiet down a bit we get Mike Leuthold to address this question? 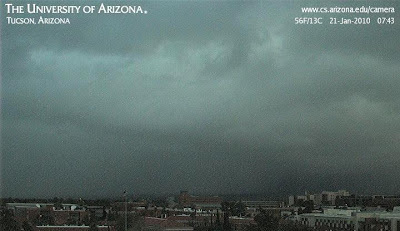 Computer Sciences webcam image showing very heavy shower over north part of town and the Catalina Foothills at 7:45 am this morning. Here at the house things were fairly quiet overnight - some sprinkles before sunrise and a trace of rain since yesterday at 7 am. 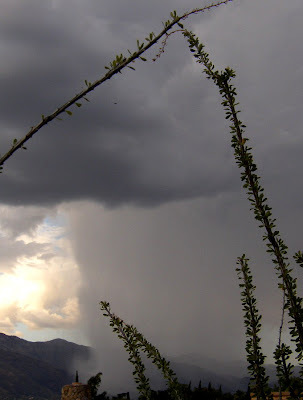 The ALERT gauges show, however, that substantial precipitation has begun again over the mountains, with Marshall Gulch in the Catalinas reporting over an inch of rain during the past 3 hours. This morning's 250 mb chart shows the very strong jetstream with the core from the Pacific eastward across Arizona and New Mexico. 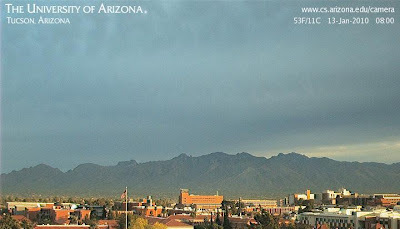 Here in Arizona heaviest precipitation during past 24 hours was over western and northern parts of the state and I noted a number of reports of more than an inch of rain - even Yuma had almost an inch of precipitation. It appears that almost nothing that could happen within the next 36 hours that isn't covered by a warning of some type - so we'll just observe what the storms brings to us! Probably the most colorful we'll ever see the Tucson NWS home page! After only 0.02" from the rain band yesterday morning, a strong line of showers and rain came through last night with 30 to 40 mph winds. Above photo shows the snow-line came down to about 4000 ft MSL. Here at house we had 0.52" during the night and the 24-hour total was the most rainfall since July 3-4, last summer. All but one of the Pima County ALERT gauges had measurable rainfall during past 24 hours and the one that didn't is probably out of service. Amounts at low elevations here in the city were generally 1/10 to 1/2 inch with higher elevation stations reporting mostly 1/2 to 3/4". Highest amount I saw in eastern pima County was 0.91" at Coronado Camp in the Catalinas. Note that amounts up in the mountains were likely higher since the snowfall was not captured in the ALERT gauges. Higher amounts occurred to the north with Luke AFB reporting 1.61" and Flagstaff over an inch of water equivalent from snowfall. The forecast by the NWS of 100% POPs last night, made more than 48 hours in advance, was excellent and very gutsy - one of the best NWS forecasts since I moved out here. The models still indicate the main event will be tomorrow and into Friday; so all eyes are now turned toward the Pacific! From Mike Leuthold - the high-res WRF forecast of 850 mb winds and Td valid 1 pm on Thursday the 21st. Very impressive - looks like a Southern Plains situation setting up out here in the desert! So far, even with all the clouds and two rain bands passing by, I can only report 0.02" of rain sprinkles. Hopefully, more in later reports. That precip amount is way out of line. The regional WRF forecast has Tucson in the precip hole again with amounts around 1/2 inch. See this graphic for total precip to see what I mean. A rain band, aligned along I-10 and zipping rapidly to the east, has produced the first rain sprinkles of the past 25 days here at the house. Light showers at sunrise and a Trace at 7 am MST. Very nice to smell rain in the air. Heavy cloud clover kept the morning low at a mild 43F. The big weather change has indeed begun - quite amazing long-term numerical forecasts from several hundred hours ago! A number of forecasts and outlooks have indicated serious amounts of rainfall and snow for the Southwest during the coming week. The radar chart above indicates that the rainy week is already underway in southern, coastal California. with snow amounts in the Catalinas up to 5 feet. I can recall since I moved here. crud out of my rain gauge! Strong, Zonal Pacific Jet Now in Place! The 300 mb GFS analysis from 1200 UTC this morning (Saturday Jan. 16, 2010) shows an extremely strong (>150 kt core), zonal jetstream across most of the Pacific. The development of this feature has been consistently forecast by both GFS and ECMWF models for about 10 days now. Simply quite amazing. We will now see what the next 10 days bring to us in the Southwest. It is a cool morning in Tucson with 500 mb S/W nearly overhead and a smell of moisture in the air. No showers at house but a heavy snow shower has been moving across the Catalina mountains. 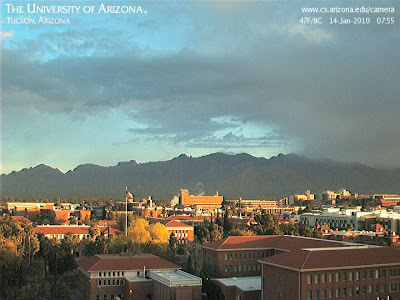 Photo from Computer Science Building on campus, above, shows the shower at right side (east half of mountains) of the view. Heavy clouds moving in from the northwest over the Catalina Mountains this morning, with some sun peeking in beneath the clouds. Some virga around as the first in a series of S/Ws aproaches. This first S/W is digging in down the coast, but the next several are forecast to come into the Southwest more directly off the Pacific. Thus, the much advertised pattern change is just about to get started. Of course this far out, the model "answers" depend on what product and what model(s) one looks at. From this morning's operational GFS run the forecasted precipitation totals from 180 to 240 hours is shown above. This would be quite a nice change for Tucson and then the next 60 hours' forecast has purple contours over southeastern Arizona. All very enticing but sometimes the GFS-world is much different than the real world - so we'll have to wait this all out. Chris Smallcomb, of Reno, had an interesting post to SUNY map weather talk list yesterday about the forecasted change to a wet pattern for the West. He used a number of nice graphics and I've shown one above. This is GFS 240-hour accumulated precipitation for the 240 hours ending at 0600 UTC 21 January 2010. Quite something, and I for one am certainly hoping that precipitation along these lines is coming our way. While I usually focus on the shorter-term numerical forecasts, I have noticed for several days now that the GFS longer-range forecasts are indicating the development of a very wet pattern for the Southwest. In the near-term, several S/Ws break under/thru the western North America ridge. But, by 228 hours (see above) from the 12 UTC initialization this morning (Sunday January 10th) the GFS forecasts six consecutive 12 hour periods of significant rainfall over Arizona - i.e., from Tuesday afternoon of the 19th right through Friday the 22nd. This would be the rainiest period over AZ in many months - IF it were actually to occur in the physical world. While I show the operational GFS forecast above, the GFS ensemble members are all quite consistent in forecasting this 72-hour period of substantial rains. Something very interesting to keep an eye on as the month progresses! First Day This Year With No Rain! The new year is off to a clear and dry beginning, starting off much like most of 2009. The photo above is from September 6, 2009 - a day on which 0.10" of rain fell here at house from the dissipating Cb. *Annual precipitation for 2009 - 7.95" which was quite dry but considerably better than the airport (TUS) did (only 5.67" making 2009 the fourth driest year ever at that location). Two months I measured over an inch of rain - July 2.63" and August 1.06" Note that 8 days during July 2009 had storms and rain that produced 33% of the year's total precipitation. *Here at the house the low temperature was in the 20's on 36 days - with December 26 and 27 being the coldest days at 20F. The location here, very near the Rillito Wash, is very cold relative to the airport - for example, the low here this morning was 24F while the airport's low was a balmy 42F (calm here and breezy at the airport). *For the first time since I started my weather log at this location there was not a single severe thunderstorm during the year, and there was no day with a rain amount of an inch or more ( heaviest 24-hour rainfall 0.77" on July 3/4). *So a very benign and dry year here - here's hoping for a better weather year in 2010!